A new study finds that developing shale gas wells that have less impact on the environment, at least at the surface, is not as costly as presumed. KNOXVILLE—Extracting gas from shale rock not only causes environmental disturbances below ground, the surface infrastructure required to drill the wells can cause a variety of problems above ground, from fragmenting fragile habitats, eroding soil, and degrading freshwater systems to displacing rare species. Minimizing the environmental consequences above-ground is possible, but at a cost to the developers. However, a new study suggests that the additional cost to developers is far smaller than the savings made to the environment. The study, which appears in Conservation Biology, found that on average, for a 20 percent increase in costs, developers could reduce surface-level environmental impacts by more than a third. To quantify the costs of avoiding environmental impacts, the researchers developed a novel algorithm to plan the construction of well pads, access roads, and pipelines at 84 sites in Pennsylvania. With close to 10,000 drilled wells, Pennsylvania was chosen as a representative state for shale energy development in the eastern U.S. The algorithm in the study plans infrastructure much the way developers do, adhering to regulations and developer practices. However, it plans infrastructure with protecting the environment as a primary goal. The researchers synthesized findings across their study sites to find the relative cost of avoiding impacts by some amount. 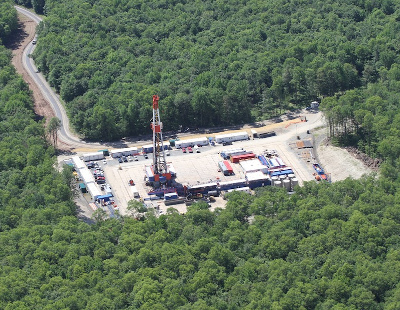 Other studies have quantified the environmental impacts of shale gas surface infrastructure, but this study is the first of its kind to quantify the trade-offs between costs of development and its environmental impacts by explicitly planning infrastructure at sites. While the study found that developers could reduce environmental impacts at a relatively small cost, the results were dependent on the attributes of the site. Some impacts were easier and therefore less costly to avoid than others. For example, the study found that a large portion of environmental impacts could be avoided by steering development away from habitats associated with rare species. Because the results depended on attributes of the site, a one-size-fits all approach to regulating infrastructure development, which is the common approach, may not necessarily be effective. "The types of impacts and developers' ability to avoid them changes from site to site, and this means forcing all developers to adhere to a uniform standard like we see in many places today could be unnecessarily restrictive. Other, more flexible alternatives exist that could reduce environmental impacts across developers for the same or less cost," said the study's lead author Austin Milt, who conducted the research while a graduate research assistant at the National Institute for Mathematical and Biological Synthesis.